Another poignant – and timely – post from Janice. Thank you so much. I am talking of an invasion of our country, a taking over of land and clearing out of people. Sharon Munro’s account, exploring the real costs to the land we love and call home, is worrying and distressing. She paints a vivid picture of everyday Australians battling to defend their land and rights against the might of the corporate giants, often in the face of devastating personal consequences, shattered health and displaced lives. A little more than 20 years ago the Upper Hunter was a beautiful rural valley where a few small mines and a couple of power stations co-existed with vineyards, horse studs and dairy farms. Suddenly, insidiously, the number of mines increased six-fold and grew bigger as they were bought out by international companies which imported bigger machines for higher production and profits. Then they began to merge and run feral across the Upper Hunter. Export dollars was the driver, Big Business and Governments the enablers. If you understand that one new mine will create disturbance over 2,000 hectares, then you can imagine the impact four or five of these open-cuts has on a small community/town in close proximity. The open-cuts, a hundred meters or so deep, surrounded by mountains of overburden, run across the landscape like gaping sores, belching millions of tonnes of toxic dust particles that are harmful, if not fatal, to human life. 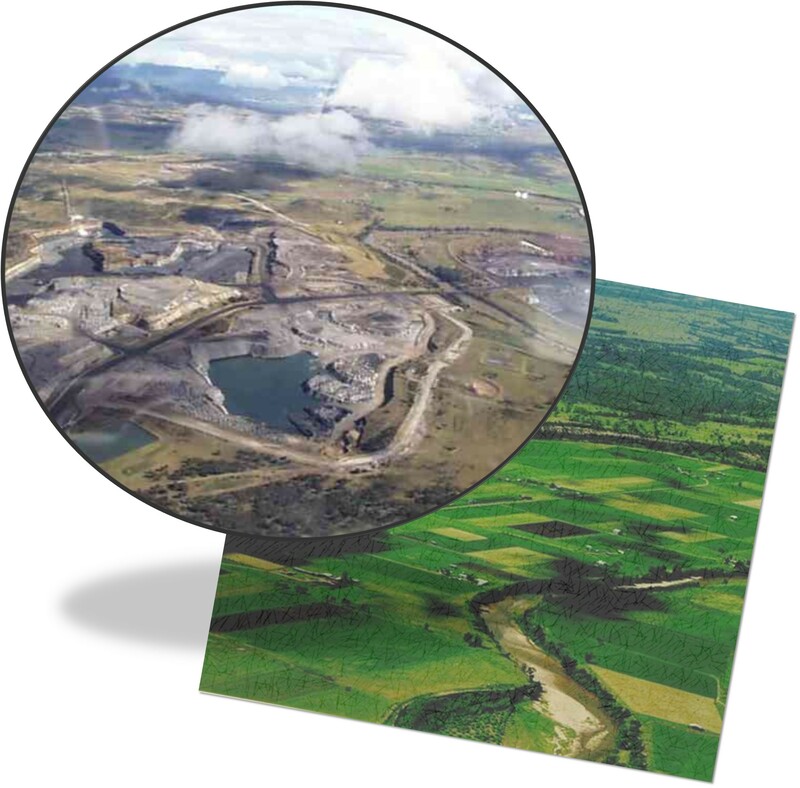 Muswellbrook has become an island in the middle of the open-cut mines. Overburden mountains have risen up all around the town and the life has been squeezed out of it. Muswellbrook people were promised there would be jobs for locals and largesse provided by the mining companies. Of course, it was too late when it was realised that any ‘local’ jobs would be mostly for those who had such skills as the mines needed – plumbers, electricians, boilermakers, mechanics etc. etc. In a year or two the citizens of Muswellbrook and its surrounds discovered they only had plumbing and electrical servicemen on a part time basis because they’d all been enticed to the mines for higher pay packets. Today the town has dozens of vacant shops and if it weren’t for the passing highway traffic, you could roll a bomb down the main street and not hit anyone. Shoppers keep to one or the other of two large shopping complexes, do their shopping, and go home. There is now no incentive to linger. People who live in Muswellbrook complain of the layers of filthy coal dust that seeps into their homes and covers their verandahs, patios and garden plants. Wybong, 20 kms to the west of Muswellbrook, was a small farming community. A scenic bit of country known as the Ark of the Hunter for its biodiversity treasures, there were many people who tried to stop Centennial Coal from going ahead with the Anvil Hill mine and in 2004 they won a Federal Envirofund Grant for ecological studies which found more than 30 threatened flora and fauna species. In 2006 an unprecedentedly diverse group – farmers, newer locals on small rural blocks, winemakers, tourism operators, Greenpeace, climate change activists, climate-concerned city and country folk, and academics – joined forces to stop the mining of Anvil Hill. It was the first major fight against King Coal. Hundreds of people arrived to camp on private land within the exploration lease. 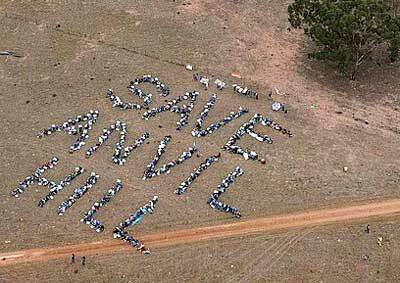 They walked out to a paddock and lay down to form a human sign – “Save Anvil Hill” – and were photographed from a helicopter. In response, NSW Minerals Council CEO Nikki Williams wrote an open letter to Sydney papers attacking “publicity stunts by a handful of activists” and claiming that “shutting down coal production” would “destroy NSW’s economy”. In December 2006, a young activist named Peter Gray won an historic victory in the Land and Environment Court against Planning’s acceptance of the “flawed and invalid” environmental assessment for Anvil Hill. But it didn’t matter what anyone did or said, because in June 2007, Planning Minister Frank Sartor approved Anvil Hill. Centennial Coal sold the project to Xstrata who renamed it Xstrata Mangoola to get rid of the taint of opposition, and let it sit awhile as the Anvil Hill Protest Group was bankrupted by its court cases against Centennial. The protesters won, yet still lost because the NSW (Labor) Government gave the green light anyway. Wybong is now a totally depressing place for the many kilometres Xstrata has fenced. Ten kilometres to the south of Wybong is the small town of Denman, the people of which believed the claims that the mine would bring more jobs and business. They were soon to realise that this was an illusion of huge proportions. What happened is it removed many small landowners and their custom, and the mine does not buy locally. There were no new jobs, Instead, the mine stripped the town of its tradespeople as they took advantage of the higher wages offered. As happened in Muswellbrook, Denman’s agricultural store is struggling to survive as the mines swallow up the farms. In Muswellbrook four irrigation and farm machinery companies closed their doors and as I write, there are four new mines proposed on the western side of Denman. If these go ahead, Denman will lose farms, vineyards and wineries, and the jobs associated with these rural businesses – and the town of Denman will shrink further. Upper Hunter winemakers are vehemently opposed to the march of King Coal and Bob Oately, who owned the very successful Rosemount winery, spent big dollars as he joined with other concerned people to stop the Bengalla Mine – a stone’s throw from the centre of Muswellbrook. 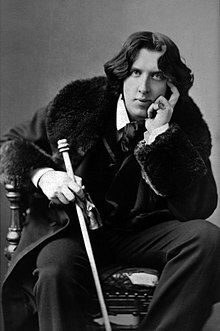 The mine was also a stone’s throw from one of Bob’s best vineyards at Edenglassie on Muswellbrook Road and his Roxburgh Vineyard a kilometre away as the crow flies. The fight went all the way to the High Court and they won. But, as happened at Wybong, Bob Carr’s Labor Government simply shifted the goal posts and the mine was approved. Bengalla Mine is smack bang in the middle of fertile river flats. When the Carr Government gave the green light for Bengalla to proceed despite the High Court ruling in favour of the protesting group, it meant that King Coal had the door opened wide to dig up the rest of the area. In a very short period of time the Mt. Arthur Mine got underway on the eastern side of Muswellbrook Road so that, together with Bengalla, the pollution spelt the demise of the Oatley vineyards. 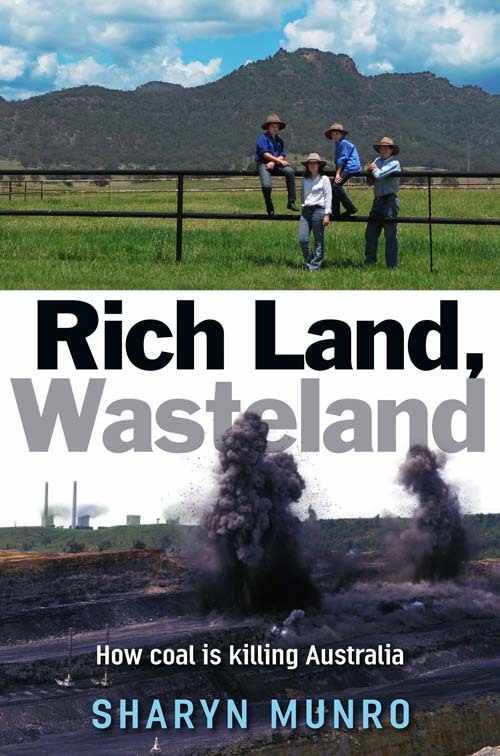 Bob Oatley’s two best vineyards were impacted by the pollution and became unviable. Rosemount winery at Denman was the town’s biggest employer and was a popular tourist attraction that was all lost because there is nothing ordinary people can do to save their livelihoods or property from these marauding corporate giants who wield the power to overrun and swallow up the land and its people. The open-cuts are quickly marching south and spreading east and west, swallowing up all in their path and landholders are in a constant state of fear for their livelihoods and their health. 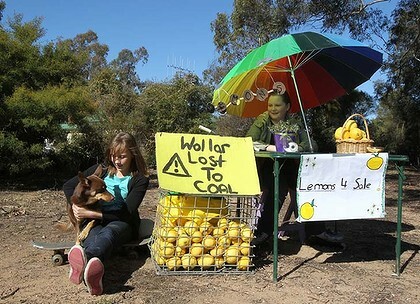 They fear for their water as much as for their environment as coal seam gas also threatens wineries and tourism. Coalmine dust risks heavy metal contamination of the water, the soil and the air but there is nothing the people can do stop the corporate giants. The corporate giants are nothing but kleptocrats – not only do they steal get our minerals at an absurdly low price, they also steal the land and the water that sustain us. Steve Gibbons’ tweet will not have to be apologized for. Watch for a Pyne flounce, or worse. Thanks to everyone commenting about QT . I am at work but every now and then I can steal a few minutes to catch up . Says heaps about the character of members of the Liberal Party. A flounce, or a couple of frills? Explains everything. I had a lib block me this morning because I reminded him last time it happened they were signed in by the LNP. He didn’t like it and blocked me. That Fairfax article linked by S.K. at 6.47’s about as bad as it gets. “Life under Abbott, don’t panic” or some such. It’s hard to escape the conclusion that he’s really writing for himself, that an Abbott government won’t give him reason to panic. Hi Bob…long time no see. Good to see you at the Pub…I’ve been lurking for a few weeks, much better environment than PB. After QT, Tone got up on his hind legs and said that Tasmanians would not suffer a loss of GST (must check Hansard tomorrow for wording). That’s not what he said to Colin Barnett. LNP in disarray must surely lead the MSM. NT ex-Chief Minister not even in the country when he got rolled. He was in Japan apparently. Looks like a knife in the back to me. Questions need to be asked of Gillard. NT is Commonwealth Territory after all. Can they even do such a thing? BB you have already nailed the anti JG angle of the NT events. It appears so. Let’s see what sort of fight Mills puts up when he gets back. Pretty gutless, even for Libs. That really IS a low blow. Dave Tollner – ex fed mp – elected as deputy. Another orderly transfer of power? the loss of one state lib government leader may be viewed as careless but the loss of two is downright incompetent ! … and how I wish I still had this poster. Well, it will be on Friday. Wow, things are moving at warp speed for the Indigenous Community in the political sphere. * the ALP choose their first Indigenous Australian to stand for the House of Representatives in the seat of Leichardt, based around Cairns.